The harvesting of Island Gold blue mussels takes place year-round to provide the freshest possible mussels 12 months of the year for markets both domestic and around the world. Our farms monitor and clean the mussel lines and attached socks daily. As mussel weight increases, more buoys are used to ensure the growing mussels float above the bottom of the water to avoid grit or sand. Socks can grow in length from 7 to 12 feet. With mussels attached, a sock can weigh up to 60 lbs. 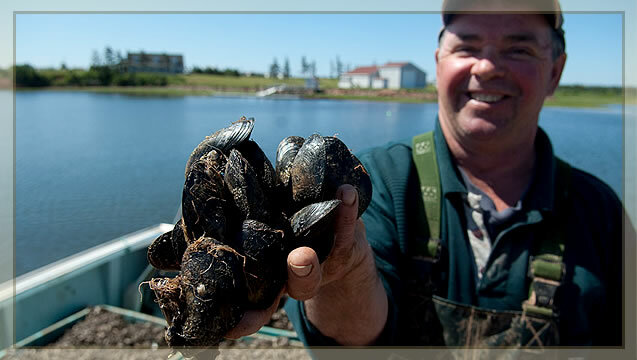 It takes approximately 16 - 24 months for the mussels to grow to market size; 2 inches minimum, before they are harvested. 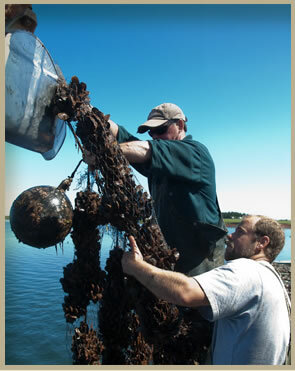 Our boats work on the waters and bays each day maintaining the cycle of growing Island Gold blue mussels. While harvesting is done using boats in the summer months, in the winter long lines are winched through holes cut in the ice and mussels are hauled to shore by sleigh. After leaving the ocean, the mussels are transported in insulated containers to the processing facility where they are kept naturally cool and damp using liquid ice. They are then inspected, cleaned and graded by hand prior to packaging and shipping. Island Gold blue mussels are harvested year-round to ensure our customers enjoy only the freshest and most delicious mussels possible.